My mother was born in the ‘Good Old Days’ of Edwardian England when Britain was enjoying the warm afterglow of the Victorian Age and was still ‘Master of the World’. She was just in time to witness the end of a way of life almost unchanged for centuries and captured in Laurie Lee’s autobiography Cider with Rosie, one of her favourite books. 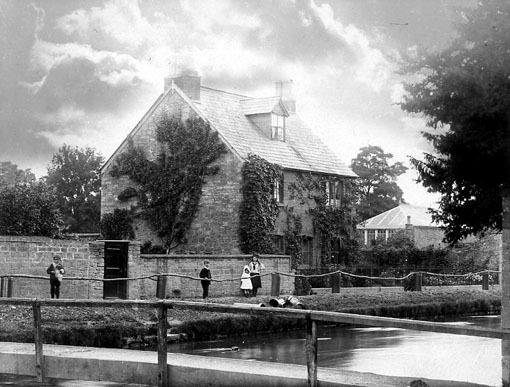 For her birthplace was also in the Cotswolds, in the idyllic village of Bourton-on-the-Water, in a fairytale cottage on the banks of the River Windrush where the horrors of the First World War scarcely penetrated. At least, that’s how I see it in my memory. Katie Page, William Page, Sonny (Percy) Page. Although she came from a country family of seven, her parents were not ordinary country folk. Pamela and I have always loved listening to Mum reminisce and our favourite must be that of grandma Page’s flight as a teenager from hated stepmother in Edinburgh to a new life and love in London. There she met the young orchid grower at Kew Gardens, soon to become head gardener and prize orchid grower for George Moor, a retired tea planter, on his Bourton estate of ‘Chardwar’. The position came with a cottage and enabled them to marry. She would proudly show us the gold medals he won at Chelsea and recall the new varieties of Cypripediums he raised and named after herself and her sisters. It was all so romantic, brave and adventuresome. Mum probably inherited a big chunk of spunkiness from her mother, as she was always so brimful of energy and high spirits. She was quite a handful at home and they probably all breathed a sigh of relief when she won the first scholarship in the village to Pates Grammar school in Cheltenham where she had to board with a local family through the week. 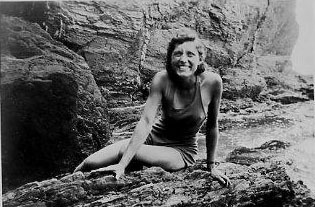 My favourite photo is of her in her early twenties, swim suited, sitting on a rock by the sea ready for anything and raring to go with a sun’s worth of energy coursing through her body and her dazzling smile. No wonder my father fell in love with her, as much later did Sidney, after Dad had died. She told us how she would invite Sidney back for coffee after church, understanding his deep suffering only too well. He was reluctant at first but she said ‘I can help you’. And of course she could. Her ‘joie de vivre’ was impossible to resist. Her early married life with Dad in Wolverhampton could not have been easy. Britain was at war and she would tell us how the sirens wailed and the anti-aircraft guns deafened on Pen common at the end of our road. She was alone with baby Pamela and later carrying me, while Dad was teaching by day and doing factory or home guard work at night. Even though no bombs fell on us a house was destroyed in the next street. No wonder she was terrified and escaped every summer to Bourton, idyllic weeks on the banks of the Windrush in the bosom of her family. After the war she escaped to her second rural idyll, St Wulstans in the village of Tibberton in Worcestershire. 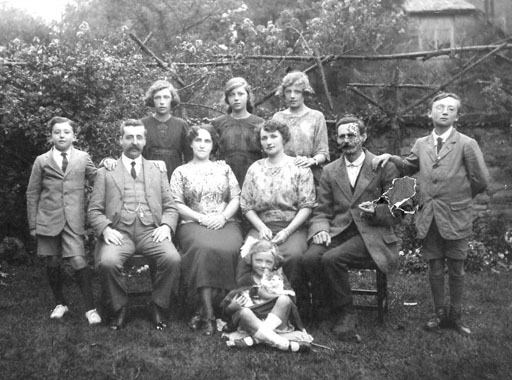 The Lewis family at home at St Wulstan's. 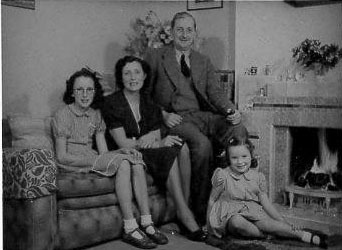 It is likely that her wartime experience made her really appreciate the preciousness of life, especially family life and children. Her early days at St Wulstans with her young family and a husband happy in a job, which had not yet taken over his life, were her golden years. She was never happier than when surrounded by youngsters of any age; her own, other peoples, her pupils at Tibberton School where she taught part-time or complete strangers. She loved them all and they loved her. She was a real child at heart, the more so the older she got. Peggy Lewis marries Sidney Box, 1972. 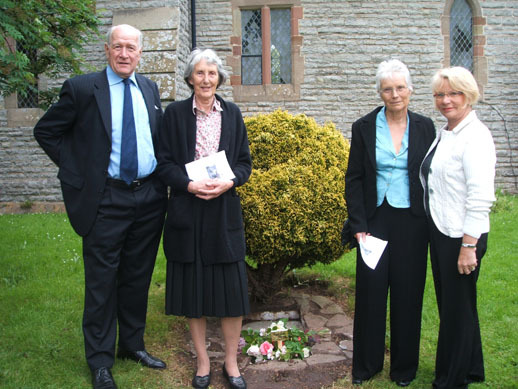 Her neighbours John and Phyll Hartwright to R.
Mum was also a survivor. Losing her first husband, in a car crash when she was 62 was both shocking and desolating for her. But she bounced back, learnt to drive and drive very well and bought a tomato coloured mini. She married Sidney three years later. Free of their children they simply had each other and she revelled in the attention and gifts he showered upon her. Their shared trip to South Africa to visit her brother Percy was the highlight of their years together. After Sidney’s death when she was 76, she came to visit me in California and captured everyone’s hearts. I picture her sitting in the outdoor hot tub in her birthday suit, overlooking the Pacific Ocean, surrounded by wild lupins and ceonothus and soaking up the sun and steam. It was the most risqué thing she had ever done in her life and she was tickled pink. In her late 80’s and 90’s she began to fall breaking her left arm once and her pelvis three times, as well as many less serious bruisings. She always made the most amazing recoveries, defying all predictions. Throughout this time Pamela and I shared supporting and eventually caring for her. 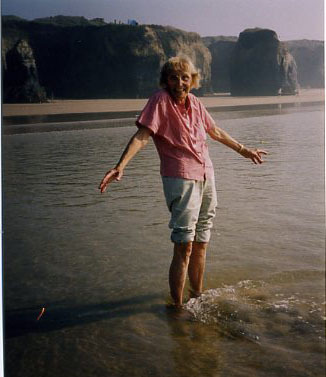 She visited us both for glorious holidays near the New Forest and in Cornwall and I spent increasing amounts of time with her in Colwall where we shared our love of music, listened to story tapes and solved crosswords together. Despite hospitalisations, from which we never thought she would recover, she made it to one hundred, the telegram and her birthday bash in the Ale House, a truly memorable event. She enjoyed her last walk with me on the Malvern Hills the following New Year, just four months before she died. But eventually not even Mum proved indestructible. After a very nasty sort of fit she rapidly declined over the next two months. She was always so fastidious with her personal care and appearance and wanted none of what she saw as the unacceptable indignities of advanced old age. We think that when she saw where things were inevitably heading she decided she wanted none of it and simply let go. 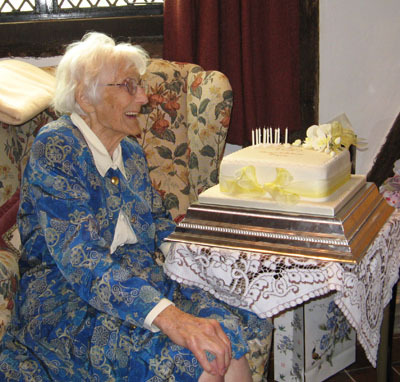 She passed away peacefully at Pamela’s, aged 100 years and 7 months. The 7 months matter for in exceeding her sister Grace’s final age of 100 years and two months she became the longest living member of her generation of Pages, Lewises and Boxes. She got a real kick out of that. She leaves behind her two daughters, three grandsons and five great grand children on Dad’s side and one step son, two step granddaughters and six step great grandchildren on Sidney’s side. We all grieve for the loss of such a dear friend, a mother, an Aunt, a gran and a great gran Peggy. But for Mum we can only give thanks and celebrate such a wonderful long and happy life as well as her courage in choosing such a wonderful ending. 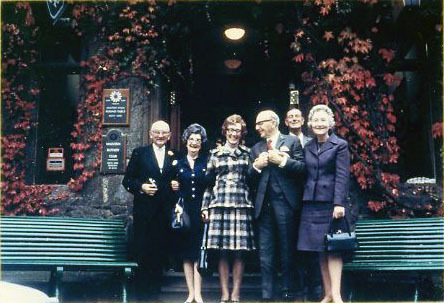 Chris Hartwright, Pamela, Rosie, Jean Hyslop (née Peer). and some were scattered in the sea at Godrevy in Cornwall, landscape of her dreams.